1 B None No Power Seat 1 B is an Economy Class Exit Row seat that is dedicated by EasyJet as an XL Seat. XL seats have extra legroom, however these seats are priced higher and come with the Speedy Boarding pass, allowing dedicated check-in and priority boarding. The proximity to the lavatory and galley may be bothersome. The tray table is in the armrest, making the armrest immovable and slightly reducing seat width. 1 C None No Power Seat 1 C is an Economy Class Exit Row seat that is dedicated by EasyJet as an XL Seat. XL seats have extra legroom, however these seats are priced higher and come with the Speedy Boarding pass, allowing dedicated check-in and priority boarding. The proximity to the lavatory and galley may be bothersome. The tray table is in the armrest, making the armrest immovable and slightly reducing seat width. 1 D None No Power Seat 1 D is an Economy Class Bulkhead seat that is dedicated by EasyJet as an XL Seat. XL seats have extra legroom, however these seats are priced higher and come with the Speedy Boarding pass, allowing dedicated check-in and priority boarding. Although XL seats should have extra legroom, passengers have reported that the bulkhead partition restricts leg movement at this seat. The tray table is in the armrest, making the armrest immovable and slightly reducing seat width. There is no floor storage for this seat during take-off and landing. 1 E None No Power Seat 1 E is an Economy Class Bulkhead seat that is dedicated by EasyJet as an XL Seat. XL seats have extra legroom, however these seats are priced higher and come with the Speedy Boarding pass, allowing dedicated check-in and priority boarding. Although XL seats should have extra legroom, passengers have reported that the bulkhead partition restricts leg movement at this seat. The tray table is in the armrest, making the armrest immovable and slightly reducing seat width. There is no floor storage for this seat during take-off and landing. 1 F None No Power Seat 1 F is an Economy Class Bulkhead seat that is dedicated by EasyJet as an XL Seat. XL seats have extra legroom, however these seats are priced higher and come with the Speedy Boarding pass, allowing dedicated check-in and priority boarding. Although XL seats should have extra legroom, passengers have reported that the bulkhead partition restricts leg movement at this seat. The tray table is in the armrest, making the armrest immovable and slightly reducing seat width. There is no floor storage for this seat during take-off and landing. 11 A None No Power Seat 11 A may have limited recline due to the exit behind. 11 B None No Power Seat 11 B may have limited recline due to the exit behind. 11 C None No Power Seat 11 C may have limited recline due to the exit behind. 11 D None No Power Seat 11 D may have limited recline due to the exit behind. 11 E None No Power Seat 11 E may have limited recline due to the exit behind. 11 F None No Power Seat 11 F may have limited recline due to the exit behind. 12 A None No Power Seat 12 A is an Economy Class Exit Row seat that has limited recline and no under seat storage. It is dedicated by EasyJet as an XL Seat. XL seats have extra legroom, however these seats are priced higher and come with the Speedy Boarding pass, allowing dedicated check-in and priority boarding. 12 B None No Power Seat 12 B is an Economy Class Exit Row seat that has limited recline and no under seat storage. It is dedicated by EasyJet as an XL Seat. XL seats have extra legroom, however these seats are priced higher and come with the Speedy Boarding pass, allowing dedicated check-in and priority boarding. 12 C None No Power Seat 12 C is an Economy Class Exit Row seat that has limited recline and no under seat storage. It is dedicated by EasyJet as an XL Seat. XL seats have extra legroom, however these seats are priced higher and come with the Speedy Boarding pass, allowing dedicated check-in and priority boarding. 12 D None No Power Seat 12 D is an Economy Class Exit Row seat that has limited recline and no under seat storage. It is dedicated by EasyJet as an XL Seat. XL seats have extra legroom, however these seats are priced higher and come with the Speedy Boarding pass, allowing dedicated check-in and priority boarding. 12 E None No Power Seat 12 E is an Economy Class Exit Row seat that has limited recline and no under seat storage. It is dedicated by EasyJet as an XL Seat. XL seats have extra legroom, however these seats are priced higher and come with the Speedy Boarding pass, allowing dedicated check-in and priority boarding. 12 F None No Power Seat 12 F is an Economy Class Exit Row seat that has limited recline and no under seat storage. It is dedicated by EasyJet as an XL Seat. XL seats have extra legroom, however these seats are priced higher and come with the Speedy Boarding pass, allowing dedicated check-in and priority boarding. 13 A None No Power Seat 13 A is an Economy Class Exit Row seat with limited under seat storage that is dedicated by EasyJet as an XL Seat. XL seats have extra legroom, however these seats are priced higher and come with the Speedy Boarding pass, allowing dedicated check-in and priority boarding. 13 B None No Power Seat 13 B is an Economy Class Exit Row seat with limited under seat storage that is dedicated by EasyJet as an XL Seat. XL seats have extra legroom, however these seats are priced higher and come with the Speedy Boarding pass, allowing dedicated check-in and priority boarding. 13 C None No Power Seat 13 C is an Economy Class Exit Row seat with limited under seat storage that is dedicated by EasyJet as an XL Seat. XL seats have extra legroom, however these seats are priced higher and come with the Speedy Boarding pass, allowing dedicated check-in and priority boarding. 13 D None No Power Seat 13 D is an Economy Class Exit Row seat with limited under seat storage that is dedicated by EasyJet as an XL Seat. XL seats have extra legroom, however these seats are priced higher and come with the Speedy Boarding pass, allowing dedicated check-in and priority boarding. 13 E None No Power Seat 13 E is an Economy Class Exit Row seat with limited under seat storage that is dedicated by EasyJet as an XL Seat. XL seats have extra legroom, however these seats are priced higher and come with the Speedy Boarding pass, allowing dedicated check-in and priority boarding. 13 F None No Power Seat 13 F is an Economy Class Exit Row seat with limited under seat storage that is dedicated by EasyJet as an XL Seat. XL seats have extra legroom, however these seats are priced higher and come with the Speedy Boarding pass, allowing dedicated check-in and priority boarding. 29 D None No Power Seat 29 D is a standard Economy Class seat in the last row of the plane however, the close proximity to the lavatories may be bothersome. 29 E None No Power Seat 29 E is a standard Economy Class seat in the last row of the plane however, the close proximity to the lavatories may be bothersome. 29 F None No Power Seat 29 F is a standard Economy Class seat in the last row of the plane however, the close proximity to the lavatories may be bothersome. 30 C None No Power Seat 30 C is an Economy Class seat whose proximity to the lavatories may be bothersome. 31 A None No Power Seat 31 A is an Economy Class seat in the last row of the plane and this row is missing a window. The close proximity to the lavatories may be bothersome. Some passengers have reported that the armrest impedes upon and reduces seat width making this seat very uncomfortable. 31 B None No Power Seat 31 B is an Economy Class seat in the last row of the plane and this row is missing a window. The close proximity to the lavatories may be bothersome. Some passengers have reported that the armrest impedes upon and reduces seat width making this seat very uncomfortable. 31 C None No Power Seat 31 C is an Economy Class seat in the last row of the plane and this row is missing a window. The close proximity to the lavatories may be bothersome. Some passengers have reported that the armrest impedes upon and reduces seat width making this seat very uncomfortable. EasyJet does not provide complimentary meals or beverages on board its flights. Passengers may purchase items on board from the easyJetshop. Products include sandwiches, hot meals, snacks, soft drinks, and alcoholic drinks. Quite nice,with reasonably good leg rom. This row of seats and the row in front 7 A,B,C is the same really both of these rows are very good seats to chose during your flight and I have personally sat in both of these rows and I think it is one of the best places to sit on the plane. The seat is small. I'm 6'2 (1.87m.) and I had no legroom. The cabin looked dated like it been around for a few years. All in all, it was pretty poor. However, considering this is low cost, and a short flight (under 3 hours), I had no complaints. You get what you pay for, and I knew exactly what I was getting myself into, so thanks Easy Jet. I will definitely do all my short hall European flights with you from now on. I prefer paying you 40 euros for this product, than paying over 100 euros for a product almost identical, that's just branded differently. The stuff were a delight! Very very good. 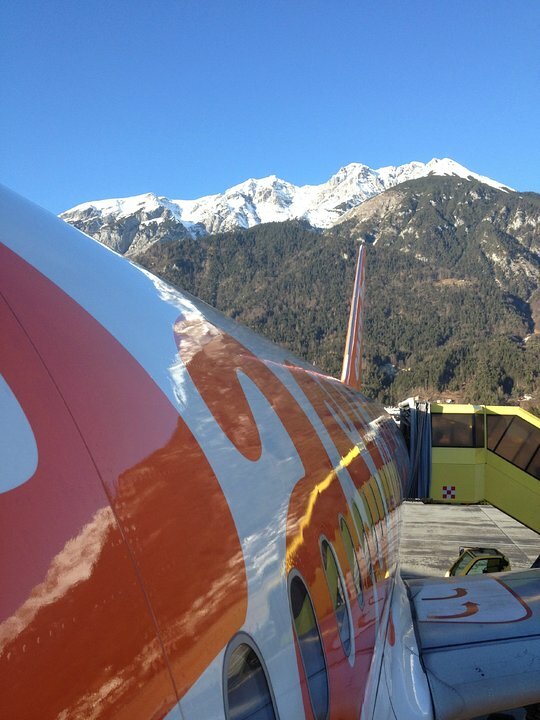 easyJet are very accomplished at cutting costs and still operating a thoroughly great flight service. Flight was 2 hours delayed due to air traffic problems at Gatwick, but ground staff kept us informed and were happy to help. I would definitely fly easyJet again, but not out of Gatwick in summer. All seats in Row 1 have extra leg room but can be restrictive. The bulkhead in front of the seats restricts the possibility to extend your legs fully. Other extra leg room seats with another seat in front do not give the same issue. 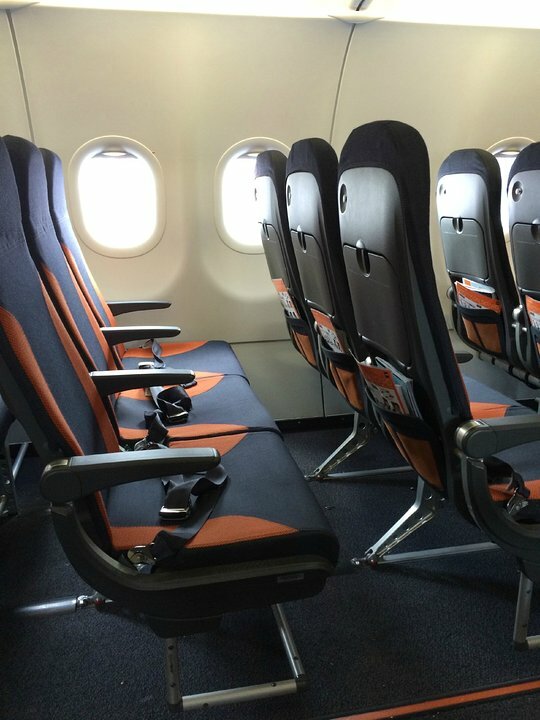 EasyJet now appears to be bringing out slimline seating on its new A320s. I was lucky enough to fly on G-EZPO, which was delivered in July 2016. This aircraft had the new seating, which, in comparison to most easyJet flights, made this one incredibly comfortable. I was pleasantly surprised with my seat on this plane. As a budget airline, I adjusted my expectations to be very low. The new seats they've added are comfortable enough for these short hauls. I felt like I had enough leg room. Honestly, good enough for the price I paid and the distance I was going (CDG to BCN). Picking the aisle seat gave me the slightest bit of extra leg room - recommended for a plane such as this. This was a bad flight. I was flying to Sharm El Sheikh (SSH) from London Gatwick (LGW) on a airbus A320-200. For a 5 1/2 hour flight. no inflight entertainment or anything to do. Leg Room was terrible. We Upgraded our seats for seat 1F flying home. Seat 11A you also have to lean forward to look outside the window. apart from that a good flight with easyjet! I am 186 cm tall and the seat on front hit my shins so could not move my legs in front at all. Thank goodness for the aisle & a short flight! Flights 2084/2085 (Luton-Tel Aviv) on a plane with the new thinner Recaro seat. Seat comfortable and seems like more legroom than older seat. Tray table a bit small, hinged from the seat back rather than the sides. Was easy to fit an Airsafe CARES belt for infact to this seat and the CARES belt pretty much stayed put and did not interfere with the tray table (both can be a problem for a CARES belt). Easyjet default (free) seat assignments for families with infants/small children (a lot on my flight) seems to be to be from the back of the plane forward. Children at the front probably on "Plus" tickets or paid for seat selection (pointless on most flights except for extra luggage allowance, families are children are boarded early and can take buggy to gate which is then put in hold). If booked on same booking, parents will be seated with children for free on all tickets (if more than 3 people on the booking then probably will be seated same side in adjoining rows in a block) Tel Aviv is one of the few airports where Easyjet uses an jetway/airbridge and hence only uses forward door rather than both doors and walk to the terminal. Great seat the only down side is the window is slightly behind you . Very good trip! Seats so much better than old a320s (no Sharklets) and a319s, very good view of the wing & Sharklet on the left side, very good for YouTube videos... Would reccomend easyJet if you know that there is an a320 with Sharklets operating it...! The new seats on the A320(SL) are wider and there is more legroom that before as the seats are thinner! Excellent chat!! My husband and I took this flight this morning out of Rome in route to Amsterdam for a short business trip. 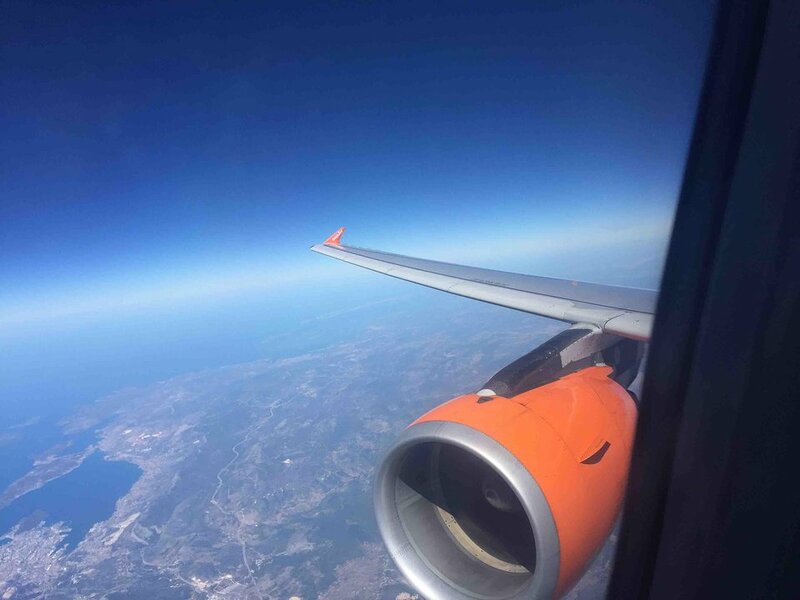 When flying solely within Europe, we always fly easyJet because they fly into major airports rather than out of the way airports. The flight was great, seats comfortable, cabin crew extremely courteous and helpful. Since my husband needed to arrive rested, he was happy to pay the 14.49 euro extra for us to be in the exit row seats. We were both famished and were looking forward to one of several delicious looking offerings but by the time the food carts reached the "premium" seats, one having started at the front of the cabin and one at the back, all that was left in the way of sandwiches, hot or cold, was one cold cheese sandwich. The lovely flight attendents said it happens all of the time even though after every flight, they request more food items to be made available and nothing changes. One would think an airline run as efficiently as easyJet would realize not being able to serve their guests in the premium paid seats does nothing to enhance customer loyalty. In llieu of stocking up on popular items, perhaps one cart could continue starting at the front of the aircaft where there are up harged seats and the second could start mid-cabin where there are also up charged seats. Last time I checked, there were none at the rear of the cabin. Seat row 29 DEF has some extra legroom due to the configuration of the cabin. It is a standard seat in the booking process however. Indeed the armrest are not aligned with the seat and make the seats much more narrow (about 10cm over the 3 rows). It is even possible that leg space is reduced. Just terrible seats. 13A was an exit seat. Excellent leg room (although I noted normal rows were cramped) Iceland>London: This was a new plane - 11 days old - with thin-backed but very comfortable seats. (Recaro?). FAs attentive but only had 12 sandwiches on board - something to do with computer-predicted demand. Not an issue as most people managed on other snacks. Very impressed and fine for the three hour journey. I love sitting at the back of the plane. I choose these seats. I'm booked on a flight in January to gran canaria iv pE booked 31a31b. Especially. First off the plane and easy access to the Loos. You also get served coffee first. Great seat. The exrta price is worth every penny in my opinion. Flew from bsl to tlv and thanks to extra leg room i slept the whole flight. Plus, you're the first off the plane???? One problem with the A320 compared with the A319. The seats are not inline but 3 toilets instead of 2, WOW. Anyway the service is good (Do remember this is a low cost airline) The best low cost airline you can fly with (RyanAir is terrible). Was on this aircraft ZRH-LGW and LGW-ZRH. On the flight out (seat 19A) it was the old style seats; Im 5 ft 7 and not slim, and I tend to feel rather wedged in, especially the width (the legs are just about ok). On the way back (seat 17E) we had the new Recaro style seats and it was BLISS!! I have never travelled this comfortably in economy. They are lightweight seats that do not recline and this somehow gives a lot more space both sideways and forwards (I think it's also in part due to the armrests being less bulky). The tray seemed smaller but is absolutely enough for short-haul, and whats more, it was higher up than usual so was not resting on my belly. I can honestly say that the 1 hr 10 min flight with the new Recaro style seats was the most comfortable of my life (in economy - I have never had the pleasure of flying Business), which is especially amazing considering I had a seat in the middle, which would normally be a nightmare. PS: Row 17 sits over the wing, so we didnt have much of a view. Row 19 did have a view. Seats 1D - 1F are sold as extra legroom seats, but they are bulkhead seats. This means that you can't stretch your legs, even if they give more 'thigh room', and you have to keep your long legs permanently bent. Also the bulkhead panel leaves no space at floor level to put your feet under. Not worth the extra money charged for anyone with long legs. 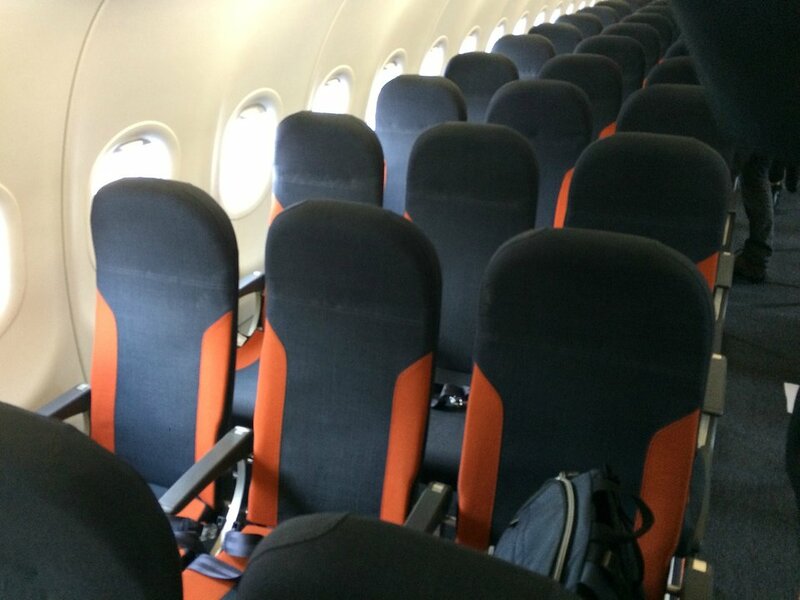 I love easyjet's new seats. They give you more leg room befause they are thinner and they do not recline. They should deffinetly add these seats to the A319's aswell. As ever the crew were very nice and helpful and the food and drinks was great. You deffinetly get what tou pay for. 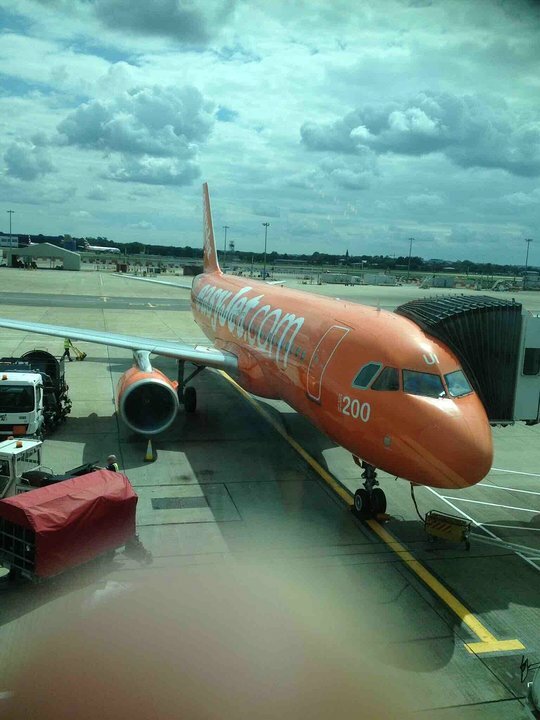 I always fly easyJet around europe and I always will.